Is it time to add a deck to your Gulf Breeze home or replace your old deck? One of the most important parts of deck construction is to choose a deck material that suits your budget, location, and landscaping. When you decide to build a deck on your residential property, you probably picture a natural wood deck. Even if you decide that you want a wood deck, you then have to determine which wood is best. Wood decks are popular for a reason. They're attractive and resilient. Which Wood Deck Material Should You Choose? Redwood and Cedar – Deck construction contractors recommend redwood and cedar because they both consist of tannins and oils that give them a natural resistance to rot and insects. Redwood also resists warping and maintains its finish, and it's a sturdy decking material when sealed and taken care of properly. Unlike redwood, cedar is quite soft and tends to splinter. Redwood and cedar are considered to be scarce resources, so environmentally conscious homeowners may want to choose a different wood decking material instead. Tropical Hardwoods – Red tauari, ipe, tigerwood, red balau, cambara, Philippine mahogany, and cumaru are tropical hardwoods that are known for their strength, hardness, and resistance to rot and insects. Tropical hardwoods are dense and heavy, so deck construction can be difficult. Tropical hardwoods are hard to stain, but if you want to stain your tropical hardwood deck, apply an oil-based penetrating stain developed for hardwood decking. Tropical hardwoods typically cost as much as redwood and cedar. Pressure-Treated Wood – Homeowners on a budget often choose pressure-treated wood because it is a widely available, affordable deck material. The lower price tag, however, often points to its lower quality. Pressure-treated wood is prone to warping and shrinking. Select a premium pressure-treated wood that is slightly more expensive than the cheaper, low-quality options because it will maintain its good condition better and longer. Despite its negative characteristics, pressure-treated wood is strong and long-lasting. 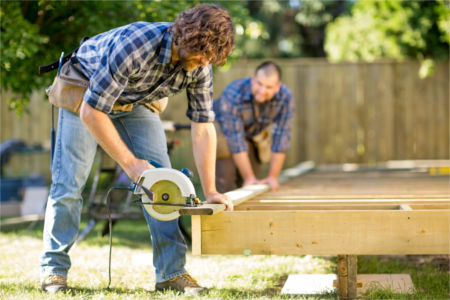 After you pick a type of wood for your new Gulf Breeze deck, reach out to All American Industries, an experienced contractor that specializes in deck construction.